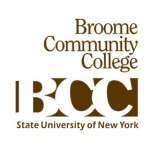 Online Histological Technician Certificate Program at the State University of New York Broome Community College is a one-year, licensure-preparing, clinically-based curriculum leading to the Certificate. Students (post associates) complete their studies on a part-time basis (less than 12 credit hours per semester). Graduates of the program are eligible to sit for New York State Licensure and national certification examinations. In lieu of campus-based student laboratories, Online HT students complete a set of preclinical competencies at an affiliated hospital within their geographical area. At the end of their studies, students will also complete clinical training (320 hours) in hospital laboratories affiliated with the program to provide hands-on experience as well as excellent training for immediate employment. The program may require more than one year to complete, depending on a student’s academic background. The department will tailor a program assuring each student the opportunity to earn the Histological Technician Certificate.